Nepal: Completely Disgusting Animal Abuse Exposed by ”Animals Nepal’ In New Bhairab Brick Factory. Please Take Actions Given. SAV – We have no further info than what is published here. Please click on the links in the text below to be diverted to other areas. 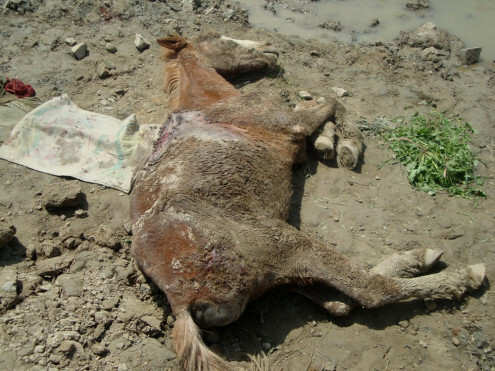 Lubhu, April 12, 2013 – Animal Nepal’s working equine outreach team today was shocked to find a grave case of animal abuse in New Bhairab brick factory in Lubhu, Lalitpur. A mule, which was literally worked to death, died this morning from deep trauma saddle wound on its back. 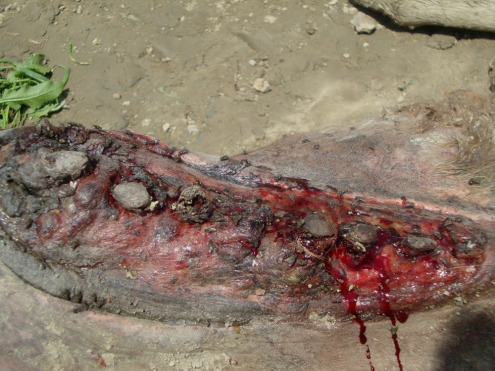 The wounds were so severe that the mule’s spine and vertebrae were exposed. Donkey Sanctuary India’s managing vet Ramesh Kumar said he had never come across such a serious case of equine abuse. “I am deeply saddened to see the conditions of equines in Kathmandu’s brick factories, and vow to do whatever possible to improve their lives,” said Dr Kumar. Already 15 equines died in a similar manner in the factory since December. 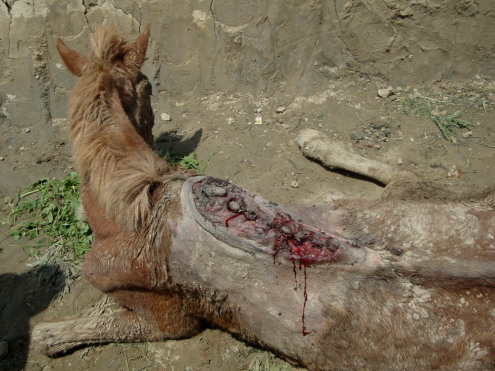 Over 30% of surviving 47 equines suffer from malnutrition, saddle wounds, blindness or other injuries. Animal Nepal’s team of paravets is presently being trained in wound management, PRA methods, hoof cutting and tooth rasping. Animal Nepal, apart from providing training to equine owners and child handlers, conduct regular mobile clinics in brick factories. The organisation has launched a campaign to improve the conditions of ‘brick donkeys’. Supporters are requested to send a letter to the Federation of Nepal Brick Factories and to sign this petition on Care2.com. Animal Nepal is a founder of Brick Clean Network Nepal, which promotes a responsible brick industry. A write up on ‘Blood Bricks’ , produced with the blood of countless working equines, child workers and bonded labourers, by Animal Nepal’s volunteer directors Pramada Shah and Lucia de Vries, can be found here.